The German word, weltanschauung is defined and derivation from Freud's 1918 article concerning worldviews is discussed. The problem of weltanschauung, or worldview (world view) is analytical, as a construct of the mind in relation to reality, this construct must be reliable if not fully accurate. Such a construct as this that deals with a differences between the real and the perceived to be, is a problem because by encompassing beliefs and observations all observers are prone to errors. In 1918, Sigmund Freud warned against that "truth cannot be tolerant" with regard to poorly constructed worldviews. from which one sees and interprets the world. about life and the universe, held by any person or society of people, the individual's worldview is usually reinforced by their group's views. 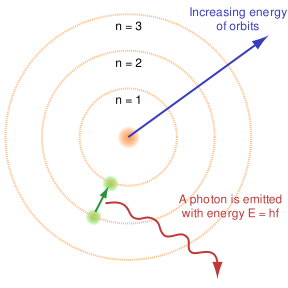 √ The belief or opinion one possesses about the condition of existence. 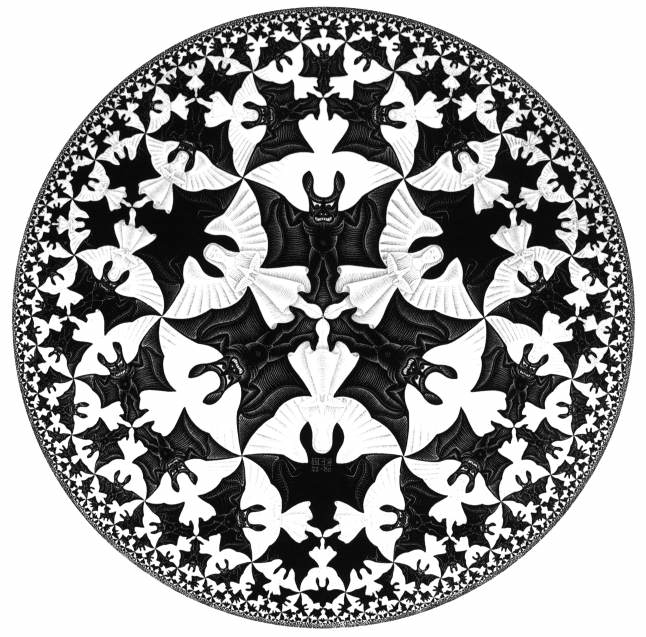 What do you see in the black and white graphic to the above right? 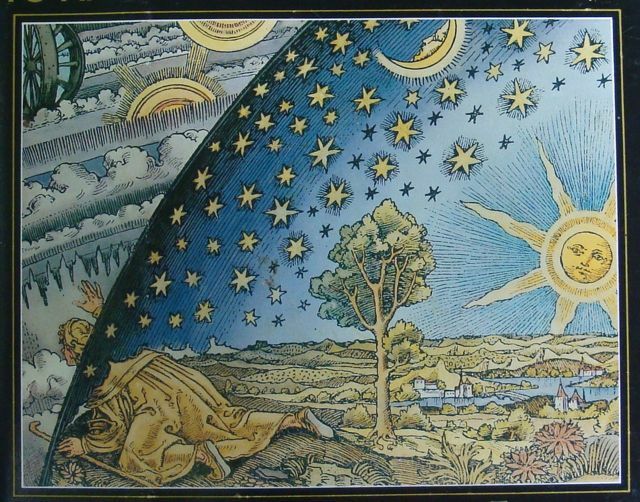 The objective and subjective acts of perceiving the world are contrasted and compared for the sake of clarifying errors --or elucidating follies-- in how reality is identified and explained. Every person compares what they see and know to other people's views. 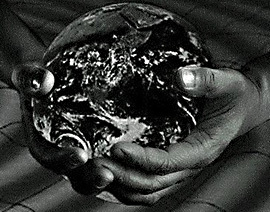 Do we hold the world in our hands? 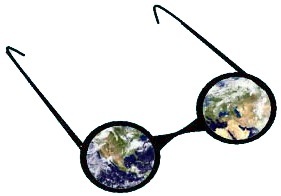 Psychologically we perceive the world in parts & wholes. 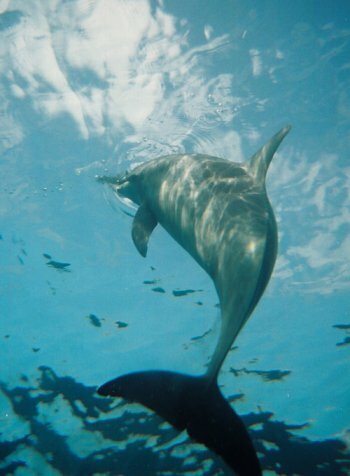 How do we see what we perceive as real? or a difference, often inherent in any age, to account for individuals beliefs or opinions about what is know during that period in history. For example, Herodotus in ancient Greece had opinions, based on his society and learning, he described the Scythians of what is today the Ukraine as barbarians and insisted that culture is shaped by geography. 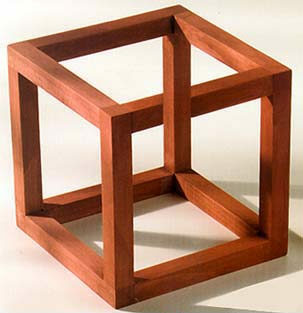 Depicting the object in relation to its actual scale and parts to the whole. 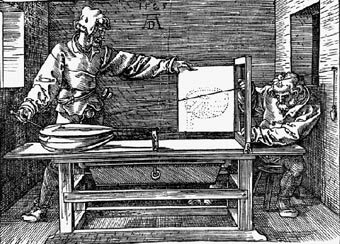 Albrecht Dürer, sketch on paper. Two opposing views of the world may clash. 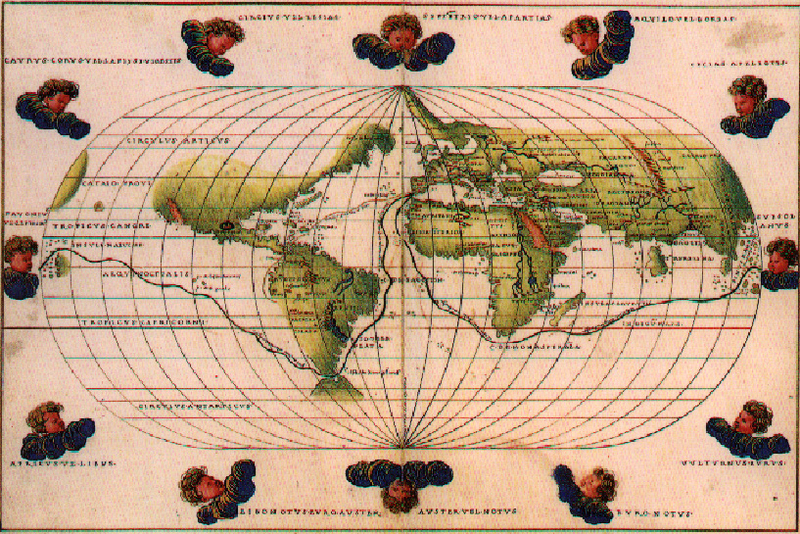 In 150 CE Claudius Ptolemy in Alexandria published this map of the world. In 1544 CE Battista Agnesi published this map in Venice after Magellan's crew returned. Newberry Library Library of Congress. 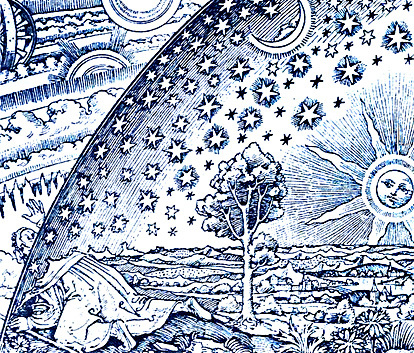 What are the differences between the ancient and the modern view of the earth? What is the difference and how would you describe that difference? Are one of these people correct, and another incorrect? 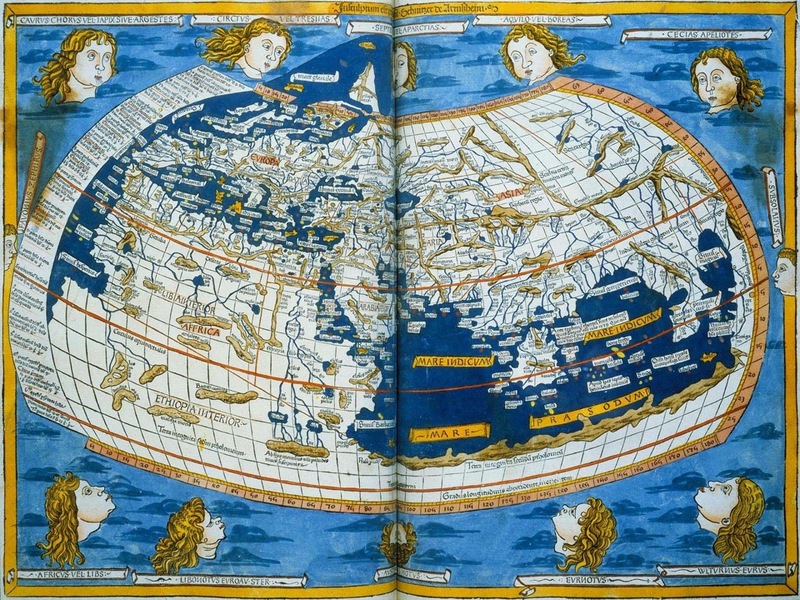 Or, are there degrees of being correct, where these two sources 1200 years apart, diverge with respect to accurately depicting a map of the Earth? To answer these questions historically, you must employ the idea of weltanschauung, or world view because human knowledge is a distortion of the actual conditions people describe often emphatically insisting that these are an accurate rendering of their world. 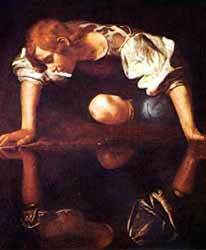 Narcissus mistakes his image for reality, in Caravaggio's Renaissance painting, Oil on Canvas 1597-99, Galleria National, Roma, Italy. Humans are prone to errors in perception, understanding and conceptualization so that some means is needed to interpret past mistakes in light of subsequent revelations to the contrary. Four Apostles by Albrecht Dürer, oil on wood, 1526. Artothek Alte Pinakothek, Munich. The painter may have been suggesting the four humors as embodied in the religious motif of the four apostles: John, Peter, Mark and Paul. In the foreground are the two men that appealed most to Martin Luther who had sparked a rebellion against the Roman Catholic Church with the Protestant reformation. John is reading his opening lines of the book of Genesis to Peter. The painted words warn against false prophets. 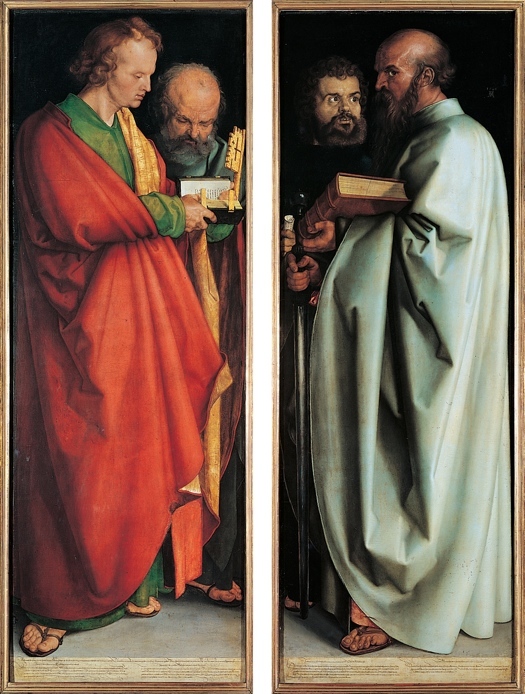 As Martin Kemp – the critic and art historian – suggests that "D�rer was fully conversant with such theories and embodied them in a number of his prints, but their most complete expression is in the two magnificent panels of the Four Apostles that the ageing artist presented as his own 'memorial' to his home city of Nuremberg . . . . each apostle embodied a specific temperament." Smarthistory; Kahn Academy, a short film discussing this work in the Alte Pinakothek, Munich. Martin Kemp. Visualizations: The Nature Book of Art and Science, U. of California Press, 2000. pp. 14-15.